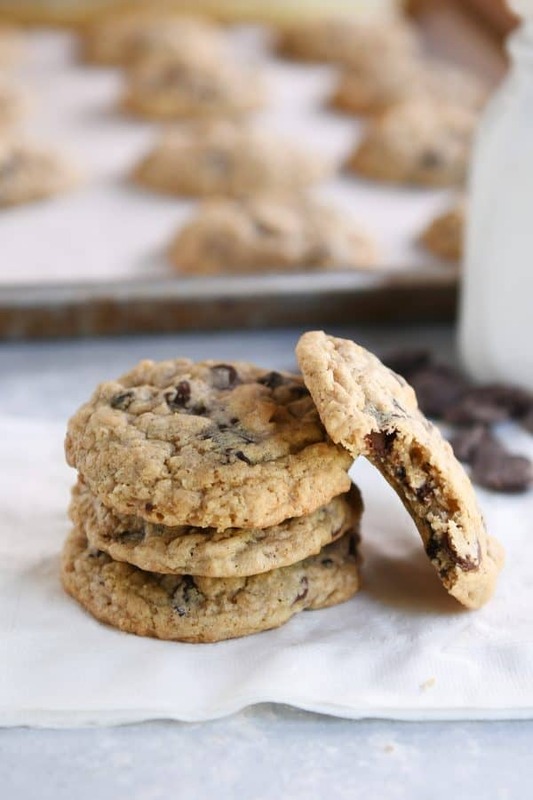 There’s nothing quite as delicious as soft and chewy, old-fashioned oatmeal chocolate chip cookies! This simple, easy recipe is my tried-and-true favorite! 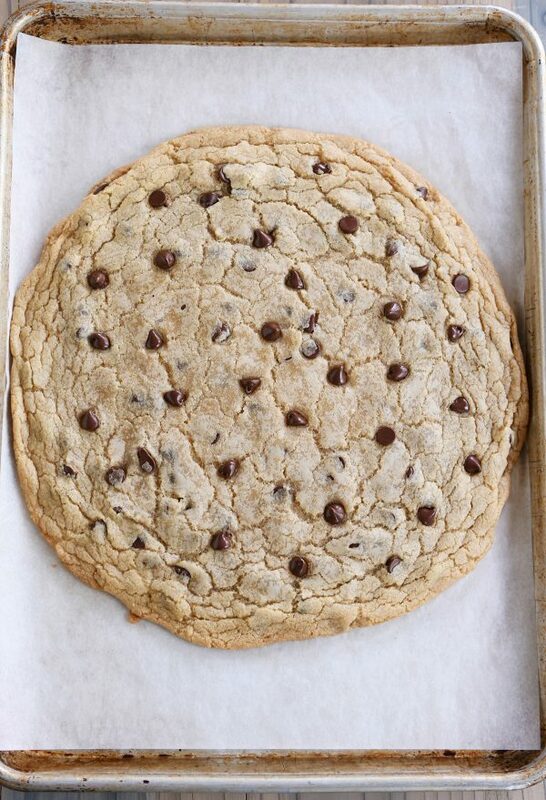 Years ago, back when I was young and carefree (you know, barely out of my 20’s and full of hope), I shared with you my favorite cookie of all time. I’m happy to report that almost a decade later (barely out of my 30’s and happily still full of hope albeit with a few more wrinkles and saggy parts), it’s still a very, very favorite cookie of mine. 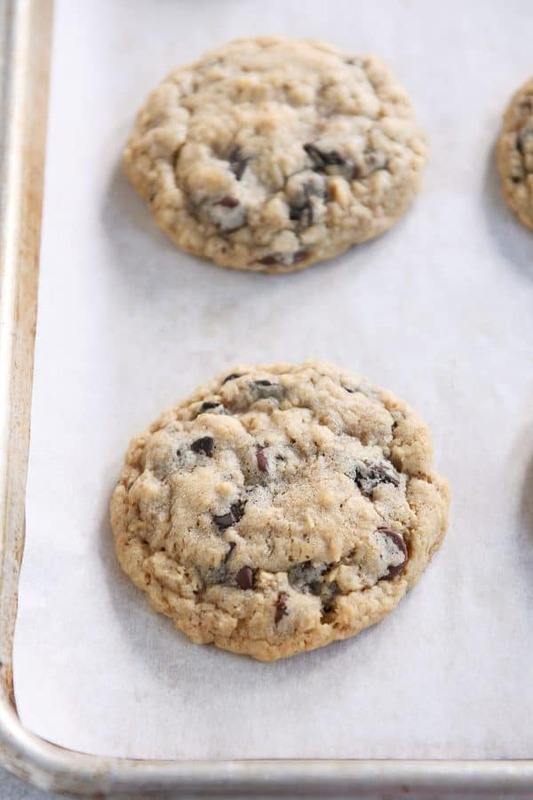 But there have been just too many cookies over the years blowing my mind and taste buds with deliciousness for that tasty coconut oatmeal chocolate chip cookie to remain the one and only. What I’ve found is that with age (and hopefully a little wisdom?) there has come a whole lotta room in my heart for a variety of favorite cookies. 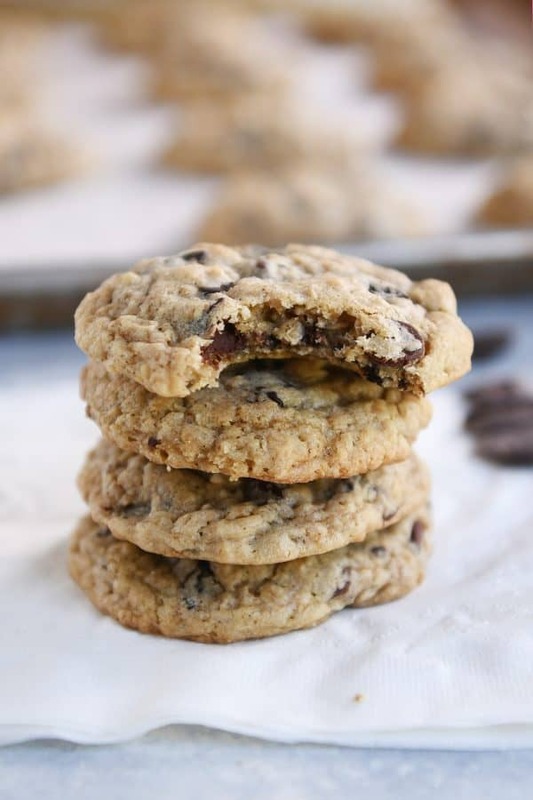 And these classic oatmeal chocolate chip cookies have a space in the favorite spot, too. 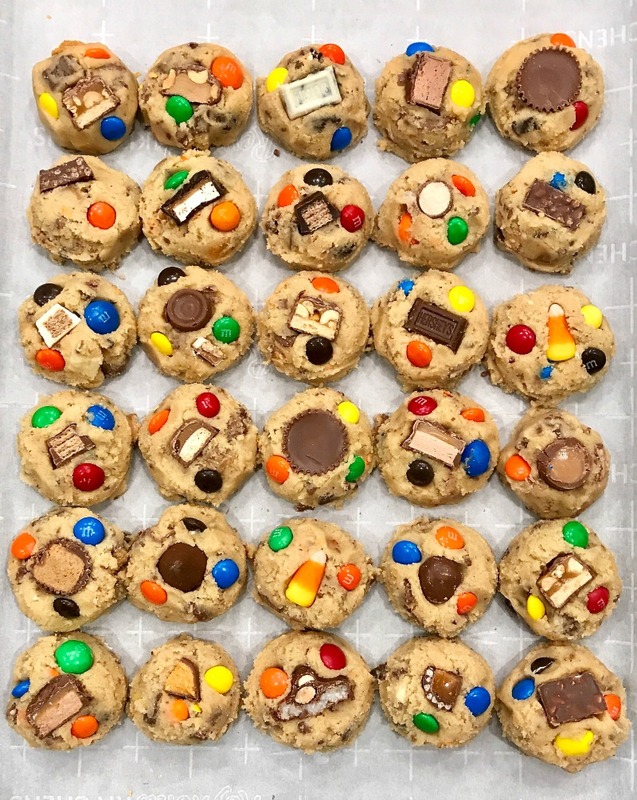 I posted the original recipe for these babies back in 2009, and they are still one of the cookie recipes I make the most (I almost always have them baked and ready to go in the freezer). They really are the best oatmeal chocolate chip cookies ever. 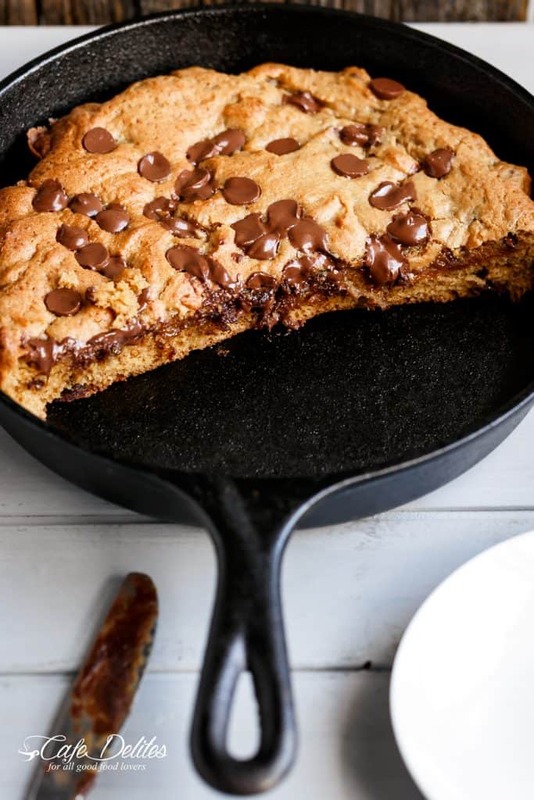 Soft and chewy, loaded with chocolate chips (i.e. no raisins in sight…nope, not for me! ), and perfectly puffy. Over the years, I’ve made a few changes. Don’t panic! 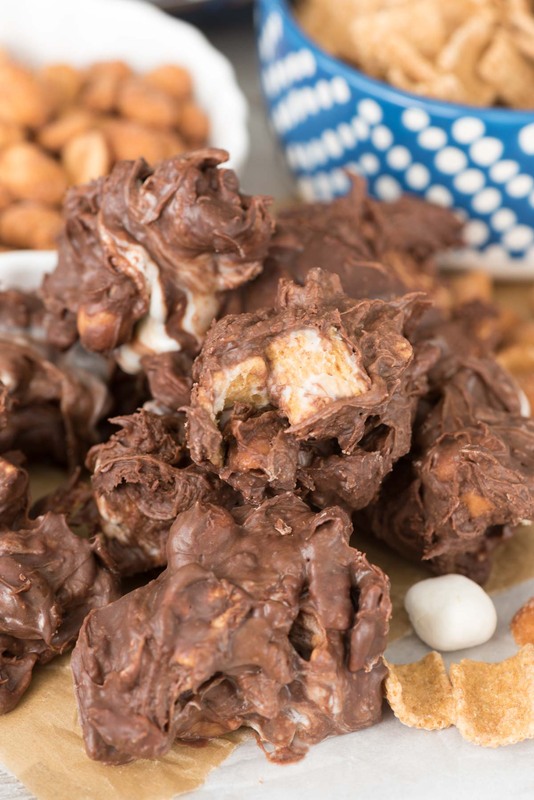 If these have been a favorite of yours, the recipe is basically the same. I’ve detailed the minor changes below (just a slight decrease in the amount of oats and some recipe notes about sugar). 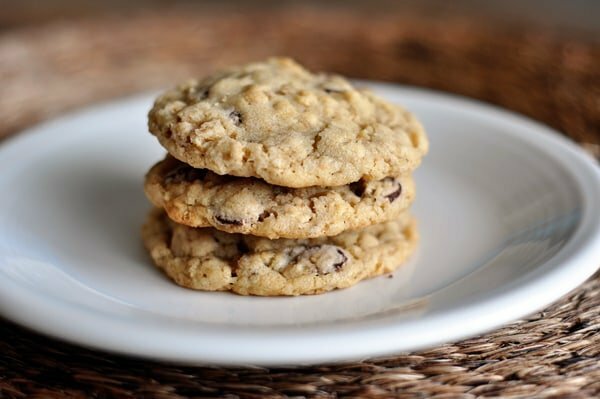 You really can’t go wrong with a good, old-fashioned, classic oatmeal chocolate chip cookie. If you don’t have a tried-and-true recipe in your back pocket, this could be the one. 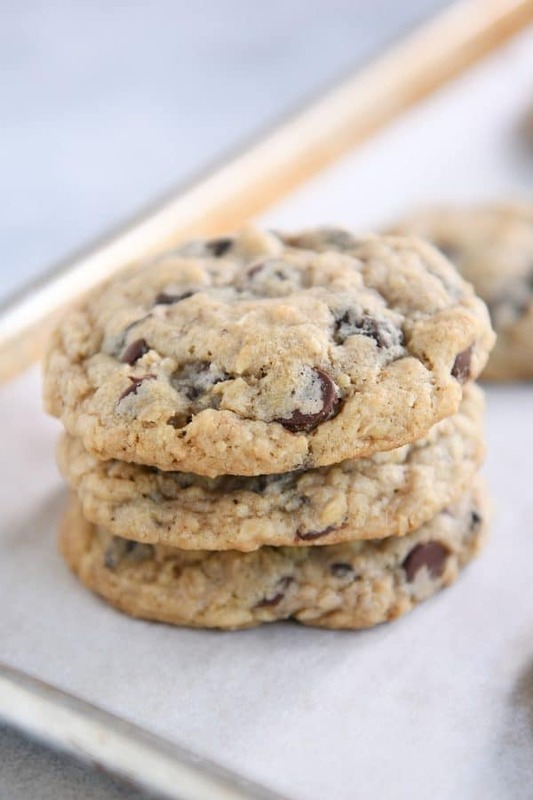 And if you are looking for a thin and crispy oatmeal cookie, this wildly popular recipe is surprisingly amazing (says the girl who always insisted thin and crispy cookies were not for her – see what a little age and wisdom will do? I feel so mature). Preheat the oven to 350 degrees F. Line two baking sheets with parchment paper, silicone liners or lightly grease with cooking spray. In the bowl of a stand mixer fitted with the paddle attachment or in a large bowl with a handheld mixer, cream together the butter and sugars until light and fluffy, 1-2 minutes. 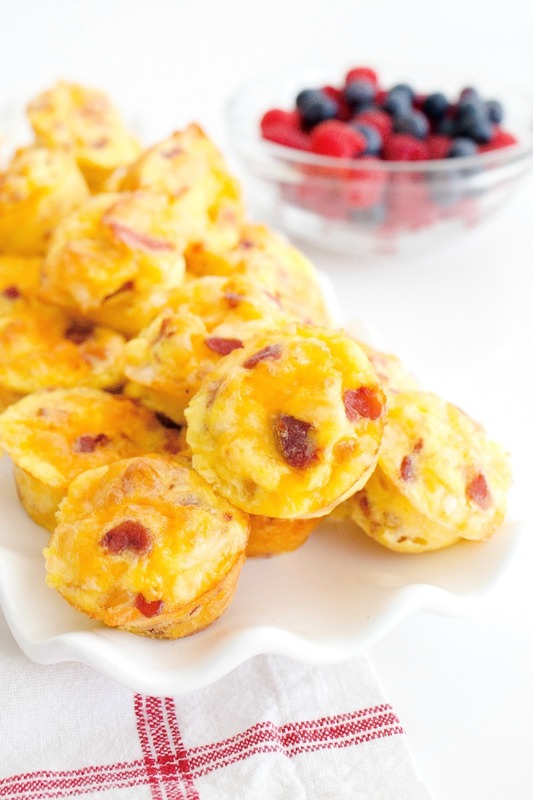 Add eggs and vanilla and beat until creamy and well-combined, 1-2 minutes. Add baking soda, baking powder, salt and mix well. 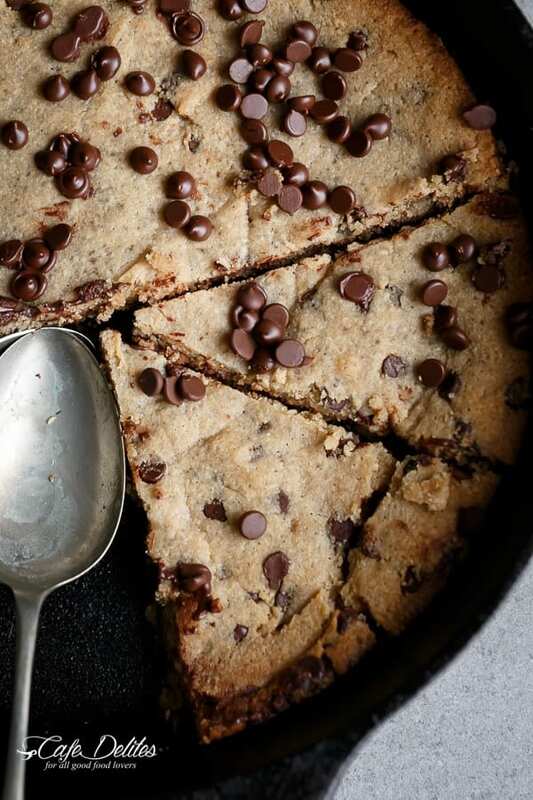 Add flour, oatmeal and chocolate chips. Mix until no dry streaks remain (don’t go crazy; just mix until evenly combined). Scoop the cookies into balls (about 2 tablespoons each) and place a couple inches apart on the baking sheets. 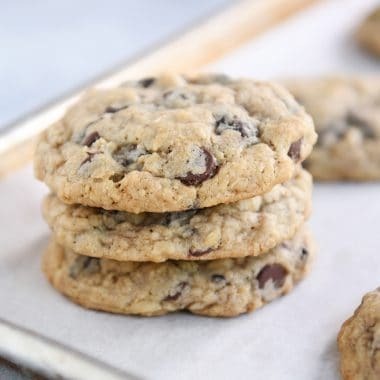 The original recipe called for 2 3/4 cups oats, but over the years, I’ve cut it down to 2 1/2 cups so the cookies spread just right, and very often, I use 2 cups (about 7.5 ounces) old-fashioned oats and 1/2 cup (about 2 ounces) quick oats. You can use all old-fashioned oats, per the recipe, and many readers over the years have used all quick oats (although the cookies may be a bit more dense and puffy). Also, quite often, I cut the sugar down to 3/4 cup (5.75 ounces) for both brown sugar and granulated sugar; works great. If your cookies are spreading too much while baking, try increasing the oven temp to 375 degrees or baking on convection (if you have that option on your oven) at 325 degrees F.
Recipe originally posted August 2009; updated with new photos, recipe notes, commentary.